Emmy and Golden Globe winner Gillian Anderson (The X-Files) delivers a masterful performance as steely DS Stella Gibson in this heart-pounding psychological thriller. Called to Belfast to investigate a high-profile murder, Gibson quickly realizes that a serial killer prowls the city. The culprit is Paul Spector (Jamie Dornan, Fifty Shades of Grey), a grief counselor and family man driven by vicious compulsions. As Gibson closes in on Spector, both the hunter and the hunted outmaneuver each other in a sinister game of cat and mouse. Will Gibson make Spector pay for his crimes before the death toll rises? An “intelligent show with tremendous acting” (The Atlantic), critics rave that “Anderson is sublime, almost otherworldly, while Dornan…matches her for icy charisma” (Daily Mail, UK). This complete collection of the award-winning drama also stars Archie Panjabi (The Good Wife), John Lynch (In the Name of the Father), and Colin Morgan (Merlin, Humans). This review contains spoilers so if you prefer going into this series blind, skip ahead to the Video, Audio, and Final Thoughts sections. A television series focusing on the hunt for a serial killer is not a rarity. However, when the show in question asks the audience to find some sympathy (however little) with the killer, that's the kind of TV worthy of attention. The BBC's The Fall lasted just three seasons, but it turned out to be one of the more taut and introspective shows that examined the mind of a killer. The series take place in Belfast, Northern Ireland, where a serial killer (who has been given the nickname of "The Belfast Strangler") has been offing young women. The audience isn't kept in suspense about who is responsible. His name is Paul Spector (Jamie Dornan) and he otherwise appears to be a family man – with a wife (Bronagh Waugh) and two young children. Paul's day job is even more opposite of his dark personality: he's a bereavement counselor. Detective Superintendent (DSI) Stella Gibson (Gillian Anderson) is the London officer called into Northern Ireland to try and find and stop the killer. She's also a contradictory character herself – as she is a by-the-numbers person at the office, but participates in rather risky behavior when off the clock, having a number of one-night-stands with men as the series progresses. If Season 1 sets up the pieces, Season 2 is all about Stella getting her man. She finally figures out that Spector is the killer, but now it's about getting him to reveal the location of a woman's he's been holding captive before she dies. The season ends with a cliffhanger that could have been wrapped up with a coda or maybe just one more episode, but instead the showrunners decided to explore some interesting ideas in a third season's worth of episodes. 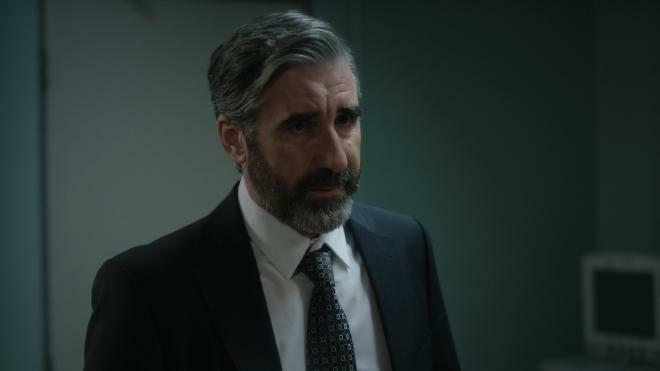 The final season of The Fall has Spector recovering from near-fatal injuries he sustained at the end of Season 2 and then poses viewers with an interesting question: If a killer can't remember what he's done, should he still be punished for the crimes? Spector's seeming loss of memory about his murders and the question of if he's faking it or not is one of the driving themes of the final season. However, even more engaging is how this last group of episodes takes time to explore the impact that Spector's actions have had on all those around him: his wife, his daughter, and even the babysitter who has had a flirtation/fascination with Spector all have their lives torn apart. They are survivors, but they are also victims. It's the kind of thing rarely examined in shows (or even movies) of this sort, and it makes Season 3 the most character-driven of the lot. The Fall is more of a dialogue-heavy drama than it is a thriller or action piece. Many of its scenes involve characters just sitting across the room from each other talking. 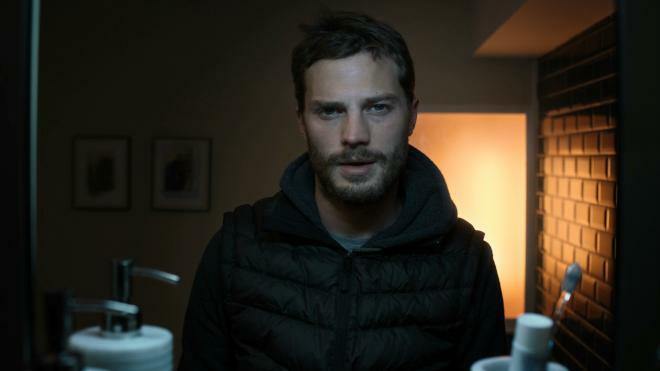 However, the acting by the two leads is the big draw here – especially Dornan as the killer, who can be emotionally appealing at times and then just flips a switch and turns into a cold-hearted psycho. I'm not sure this series is something most will want to view multiple times, but for first time viewers, it's an engaging ride. 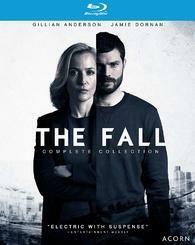 This Complete Collection of The Fall lands on Blu-ray in a thicker-than-usual Elite keepcase, which houses the six discs (four of which are held on a pair of plastic hubs), along with a single insert advertising the Acorn TV app. All but one of the discs (Disc 2 of Season 1, which is single-layer 25GB) are dual-layer 50GB. The six discs in this release are identical to the discs that are available in the individual series sets. Disc 1 of Season 1 of the set is front-loaded with trailers for Acorn TV, The Field of Blood, and Restless; Disc 1 of Season 2 is front-loaded with trailers for Acorn TV, New Worlds, and Black Work; and Disc 1 of Season 3 is front-loaded with trailers for Acorn TV, The Level, and Deep Water. All the main menus are similarly designed, with a still shot of the two lead characters and menu selections vertically down the top left corner of the screen. The Blu-rays in this release are all Region A locked. Each episode of The Fall was shot digitally on Arri Alexa equipment and is presented here in the 1.78:1 aspect ratio. All three seasons have a similar look (and similar problems), so there's no need to dissect each individually. The image often has a flat, someone muted look to it, that really only shows off any depth when the footage takes place outdoors. Lack of depth doesn't mean lack of detail, however, and most shots have a nice definition in the 1080p format. The biggest nagging issue is banding, which is obvious (if you're looking for it) in a number of shots throughout all three seasons. Noise/pixelation is less obvious, but it's there and noticeable in many of the background shots. Aliasing also occurs in a few scenes, although it's far less frequent. Despite the issues listed above, this is still overall a decent transfer and nothing to get too concerned over. While some of the glitches are obvious, none are so frequent as to take away from one's enjoyment of the series. The only audio option for each episode is an English 5.1 DTS-HD Master Audio track, which sound solid considering The Fall is primarily a dialogue-heavy series with only small portions of action sprinkled in throughout. The audio does a really good job of providing what level of immersion it can, with lots of ambient noises, although not much in terms of LFE use. The spoken word is almost exclusively front and center, but properly mixed with the rest of the track(s) and clear and intelligible (important, since sometimes the Irish accents take a bit of getting used to). This isn't the kind of audio that is going to show off one's home theater setup, but it's competently put together and free of any obvious glitches. Behind the Scenes (HD 12:56) – A look at the development and shooting of the first season, featuring comments from Producer Julian Stevens, Director Jakob Verbruggen, Makeup and Hair Designer Pamela Smith, Production Designer Tom McCullough, and stars Gillian Anderson and Jamie Dornan. Behind the Scenes (HD 12:01) – A look at the development and shooting of the second season, featuring comments from Creator/Writer/Director Allan Cubitt, Producer Julian Stevens, Director of Photography Ruairí O'Brien, Production Designer Tom McCullagh, and stars Jamie Dornan, Gillian Anderson, John Lynch, Archie Panjabi, and Colin Morgan. Deleted Scenes (HD 9:58) – A collection of 11 deleted scenes from the second season of the series. None of these scenes are labeled, and viewers don't have the option to watch them individually, although chapter stops are included. Photo Gallery (HD 2:07) – A look at both promotional and behind-the-scenes photos from Season 2. There's no option here to use one's remote to browse through these, so if one wants to take a longer look at any particular photo, they'll need to use the pause button on their remote. Music from the series plays in the background during this presentation. There are 21 photos in all. Behind the Scenes (HD 8:32) – A look at the development and shooting of the third and final season, featuring comments from Producer Gub Neal and stars Gillian Anderson, Jamie Dornan, and Aisling Franciosi. Deleted Scenes (HD 8:42) – A collection of 10 deleted scenes from the second season of the series. Once again (as with Season 2), none of these scenes are labeled, and viewers don't have the option to watch them individually, although chapter stops are included. Photo Gallery (HD 1:20) – A look at behind-the-scenes photos from Season 3. There are 13 photos in all. The Fall isn't typical TV fare when it comes to a series revolving around a serial killer. Instead of giving viewers a lot of violence and gore, it instead provides a psychological examination of a sociopath who is all too human. With strong performances all around, particularly from leads Gillian Anderson and Jamie Dornan, this series is worth a spot in one's collection. Recommended.